The moment you step in the back yard, you'll know vacation has begun. . . time stands still as the laid-back island lifestyle takes over...Totally remodeled, canal-front home, quiet and in the nicest of neighborhoods (Plantation Key Colony). 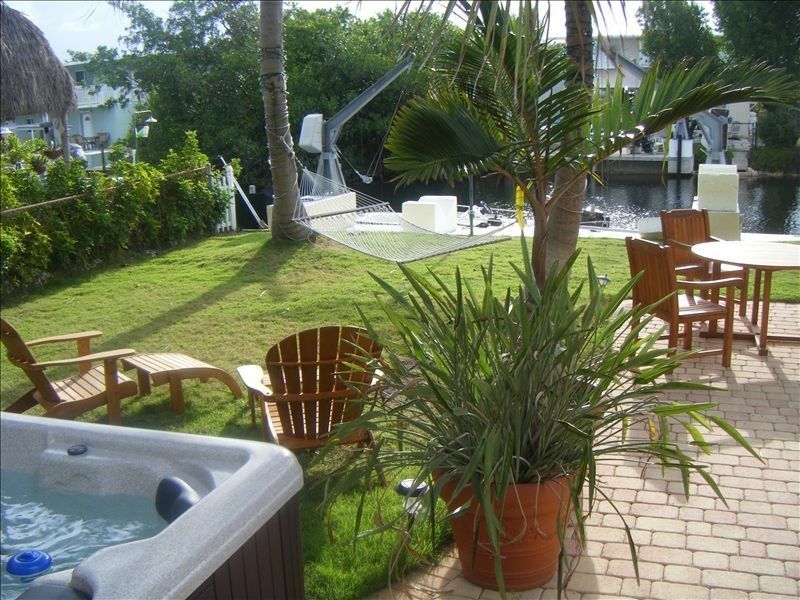 The 2 bed/2 bath stilted, upstairs unit of duplex, island retreat is surrounded by palm trees and coconuts. Relax in our Tiki Bar, In the mood for a siesta- the hammock awaits you! Watch Manattes and Tarpon from the back yard. House has a 50foot cement dock with a fish cleaning table and outdoor shower head and only minutes from the bay and the local boat ramp is close. Upon exiting the canal there is a great bay area for wakeboarding, skiing, tubing etc. Snake Creek and Tavernier Creek are just minutes away and easy access to the ocean. The home has 2 new flat screen TVs,cable,DSL, fully remodeled kitchen, wahser and dryer. Enjoy the brand new hot tub in the backyard!There are also 2 kayaks that you are more than welcome to use! LOCATION: Centrally located just 70 miles south of Miami and 90 miles north of historic Key West, Captain Shawn's Backyard is easily reached by car or boat, with ocean or bay access through Tavernier Creek, Snake Creek, or Whale Harbor Bridge Tucked with in a residential neighborhood boasting a convenient location close to all the local attractions and just minutes from the best fishing and diving in the U.S.A.
Come soon... your tropical getaway awaits you! Capt Shawns Backyard is steps away from Florida Bay----FISH ON !!!!!!!! Beds: 1 king, 2 twins, Pull-out sofa and fold-up bed. We hope you enjoy 'Captain Shawns' as much as we do. Fish On! This is truly a boater's paradise ... You wont every want to leave the Tiki. The backyard is beautifully landscaped with coconut palms, pavers, and zoysia grass. The tiki bar is equipment with a bar, television, gas grill, and outside shower. No matter your idea of relaxation, there is something for everyone - Founders Park with its lagoon style beach, olympic size pool, dog park, marina and more. For the flats fishermen -Flamingo national Park is close with ocean access only minutes away. Also enjoy snorkeling, diving, kayaking, shelling, jet skis, boat rentals, eco tours, sandbars, kiteboarding, shopping, nature parks, camping, museums, too many to list. Consider The Diving Musuem, Fish Bowl Bowling, Theatre of the Sea, The Rain Barrel Village of Artists, Robbie's feed the Tarpon, and many others.No boating experience - not a problem , the Islamorada charter fleet is close where you can enjoy diving and fishing Islamorada is known as having the best restaurants in the Keys. There are many choices, ranging from local flavors to elegant dining. All within a short driving distance and some you can easily reach by boat. Some favorites are Island Grill, Kaiyo Sushi, Morada Bay Beach Cafe, Pierres's, Uncles, Green Turtle Inn and Islamorada Fish company. Enjoy! The house is located just south of Tavernier Creek so it is easy and quick to get to the ocean. The house was very clean and the owner lives in the downstairs unit of the house which is convenient if you need anything or have questions. Great property overall. We spent 9 days at this wonderful place in the Keys. The house is wonderful and has everything a person would need. Very clean and comfortable. We love to cook and the kitchen is very well equipped. The backyard is incredible. Just so wonderful. We had a great place to keep our boat at the dock and had so much fun just playing right there with the kids. Thank you Mary for having such a wonderful place. We will return.!!! Just stayed at Capt. Shawn's 4/2 4/9/11. There are no hidden surprises here, and I finally felt like I hit a home run on VRBO. Clean, comfortable and every amenity you need, just like promised and pictured on this site. We pulled our 22' center console down, and the yard has plenty of room to maneuver. The house is near the end of the street, with plenty of turning room. Community boat ramps a few blocks away, and is very well maintained. House's canal is only a 5 minute drive. Tavernier Creek is a bit narrow, but we were out in the ocean channel in about 15 minutes. Very nice location! Would recommend to anyone. Our month stay went too quickly. House is very comfortable and well equipped. Enjoyed sunrises on the deck with a cup of coffee. Easy access to everything. We ate lunch at Mrs. Macs, Key Largo. Great food. We enjoyed pizza at Boardwalk Pizza (yum). Ate at Alabama Jacks, Key Largo (country western band on Saturday & Sunday). At John Pennykamp State Park, we enjoyed glass bottom boat cruise of coral reefs. The house had a gorgeous yard with a jacuzzi... I found myself spending most of the time under the tiki hut, laying in a hammock or barbecuing. The location is also great with a restaurant and grocery store within walking distance. We two couples stayed here a week in mid-April and were highly impressed. The house was spotless and had very nice upgraded accommodations. We thoroughly enjoyed everything in the backyard, from the nights in the hot tub to hours under the tiki hut (especially nice during rain showers!). The two hammocks were also a special touch. It was great to dock our boats, with a short ride out into the Bay and Ocean. Even got to pet a manatee in our canal. The owner and housekeeper were very helpful and friendly. We four thoroughly enjoyed and highly recommend! You can park your boat trailer infront of the house and there is a community boat ramp for your use.